CCOHS has an established history of collaborating with many Canadian and international partners. Projects with leading workplace health and safety organizations in Canada have expanded the quality and quantity of resources and programs available to workers and employers across the country. Work with international partners, including the World Health Organization (WHO) and the European Union, has helped to advance health and safety in the workplace on a global level. These partnerships, in addition to its position as one of the Collaborating Centres of the International Labour Organziation (ILO) and WHO, allow CCOHS to provide Canadians with information from international sources and to share our own knowledge and expertise in return. In partnership, we've created websites, developed e-courses, managed projects, written publications and conducted research. Together, we can work to prevent injuries and illnesses, and ultimately make all workplaces healthy and safe for everyone. 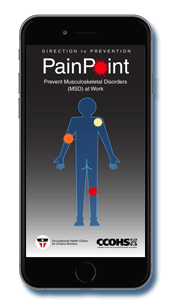 Partners: This app is the result of a valuable and productive professional collaboration, combining the technological knowledge and communication skills of the Canadian Centre for Occupational Health and Safety (CCOHS) with the clinical expertise and ergonomic content of the Occupational Health Clinic for Ontario Workers (OHCOW). 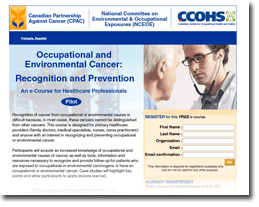 This course teaches primary health care providers how to recognize occupational and environmental cancers and how to respond to this finding. Insights are provided into how the recognition of occupational and environmental cancer risks can lead to prevention. The WHMIS for Saskatchewan Workers, Saskatchewan Workplace Inspections, and Incident Investigations in Saskatchewan Workplaces e-courses are designed to enhance accessibility to health and safety learning opportunities for Saskatchewan workers. 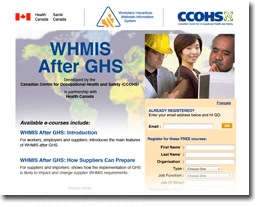 Through three e-courses and a webinar, all free of charge, participants are introduced to the expected changes to WHMIS after the anticipated implementation of the Globally Harmonized System of Classification and Labeling of Chemicals (GHS). Suppliers, employers, and workers can learn how they can start preparing now to ensure as smooth a transition as possible. 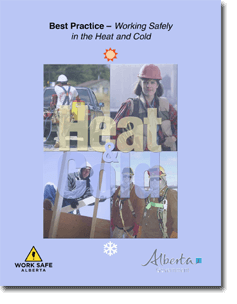 This publication aimed to help workers understand the health risks associated with working in extreme heat and cold situations, and to suggest reasonable solutions for the workplace. This tool kit was developed as a practical resource for Alberta office and other workers. 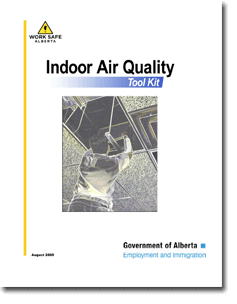 The publication provides an introduction to indoor air quality (IAQ), identifies key workplace problems, provides survey tools and a primer on HVAC systems, helps in assessing and resolving a wide range of IAQ issues, and gives current standards and guidelines that are of Canadian interest. CCOHS developed a series of WHMIS Quick Facts posters for Health Canada, in English and French, with information on labels, hazard classes/symbols, MSDSs, education and training requirements, and more. CCOHS researched and developed an inventory of best practices for healthcare work settings. These best practices include governmental advisory reports and guidelines, industry recommended practices, case studies, research interventions and systematic reviews. This study evaluated the accuracy of hazard information disclosed on MSDSs for products containing lead compounds that are intended for use in Canadian workplaces. The study provided results that support WHMIS enforcement at the federal, provincial and territorial levels. When any party raises concerns about WHMIS classifications, the issues can be discussed and resolved through the collaborative efforts of this group – providing an authoritative resource for all Canadians. 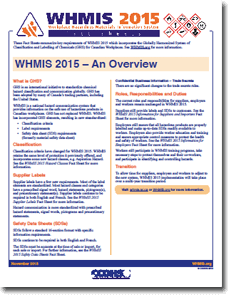 Through its efforts to harmonize WHMIS classifications and to respond to classification questions submitted by stakeholders, CCOHS' involvement is vital to supporting Canadian WHMIS activities and harmonization. 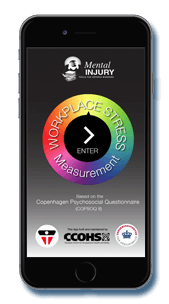 In January 2013, Canada launched the world's first National Standard on Psychological Health and Safety in the Workplace. This voluntary Standard is commissioned by the Mental Health Commission of Canada which sets a new, higher standard of care for employers and conduct for everyone in the workplace. CCOHS has adopted the standard, with the goal of sharing both the successes and challenges learned along the journey, to help other Canadian workplaces with implementing their own programs. The Marine Inspectors' Bookshelf CD-ROM illustrates CCOHS' commitment to working with its Marine Safety partners. Now in its 21st release, the Bookshelf provides hundreds of Transport Canada marine inspectors with a convenient means of accessing accurate information aboard ships, even when in remote areas without Internet access. Chongqing is a city in the southwestern interior part of China with approximately 6 million migrant workers. Their health and safety is frequently at risk. Key legal and governmental organizations in Chongqing have teamed up with CCOHS in a Policy Options Project to learn about Canada's experience of workplace health and safety and insurance of new and migrant workers in order to help develop local legislation. In this annual contest, secondary students from across Canada are encouraged to submit social media-friendly videos that illustrate the importance of workplace safety, with provincial winners moving onto the national stage to vie for cash prizes and recognition. 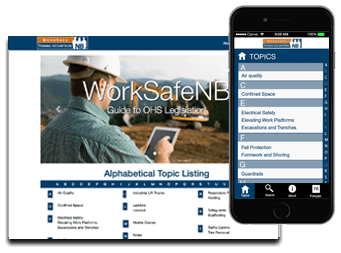 The CanOSH website makes it easy for anyone to locate Canadian workplace health and safety information, by bringing together federal, provincial and territorial resources all in one place. Information is used to ensure legal compliance, improve workplace health and safety practices, and reduce workplace injuries and illnesses. Mental health disorders place a heavy burden on the health and productivity in Canadian workplaces, and there is an enormous potential for using the workplace to address mental health problems, to promote psychological health and to provide solutions for referral and rehabilitation. 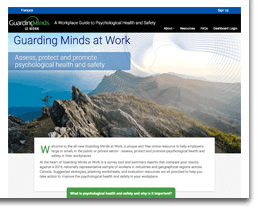 The Guarding Minds at Work website helps employers promote psychological safety and health in their workplace. 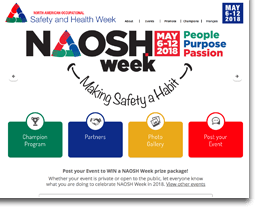 Canada, the United States and Mexico agreed that together, they would organize NAOSH Week to make their respective populations aware of the importance of preventing workplace accidents and illnesses. 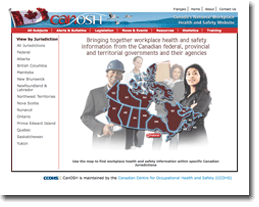 First launched in 1997, CCOHS developed the NAOSH Week website since its inception as part of its promotional support efforts. 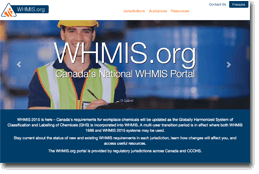 Partners: WHMIS.org is provided through the collaboration of Health Canada, the Canadian Centre for Occupational Health and Safety (CCOHS) and all the federal, provincial and territorial occupational health and safety regulatory jurisdictions across Canada. CCOHS is the site Administrator.